UDM Downloads > WinX PSP PDA MP4 Video Converter! 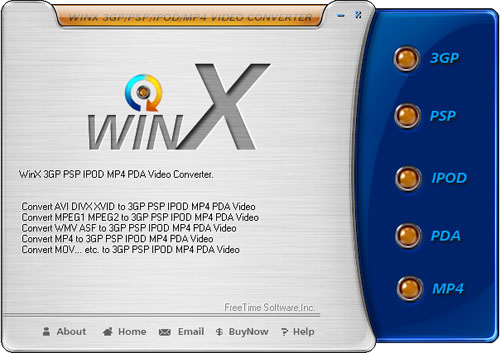 WinX PSP PDA MP4 Video Converter provides you with a integrated set of tool to convert Avi,Divx,Wmv,Asf,Mpeg-1,Mpeg-2,etc video format to PSP/PDA/Mp4 video format. with this powerful tools you can easy convert all popular video movies to your Mobile device video file format. Key Features : Easy to use,you did not need any professional knowledge just choose your Mobile device from the list. High quality picuture and sound ,we guarantee high-quality to fit on your Mobile device,you did not need to worry about the audio and video quality. Support all almost popular formated video files ,Avi Divx Xvid Wmv Asf Mpeg-1 Mpeg-2 Mov ,etc. You get standard PSP/PDA/Mp4 video files to fit your Mobile device. fast converting speed ,60 mins movie you just need 10 mins to convert it to PSP/PDA/Mp4. Easy to add and save your custom setting . Convert Avi to PSP,Avi to PDA,Avi to MP4. Convert Divx to PSP,Divx to PDA,Divx to MP4. Convert Xvid to PSP,Xvid to PDA,Xvid to MP4. Convert WMV to PSP,WMV to PDA,WMV to MP4. Convert Mov (quicktime format) to PSP,Mov to PDA,Mov to MP4. Convert Mpeg1 to PSP,Mpeg1 to PDA,Mpeg1 to MP4. Convert Mpeg2 to PSP,Mpeg2 to PDA,Mpeg2 to MP4. Convert almost popular video to PSP,video to PDA,video to MP4.